Steve Howe is best-known for being a progressive rock pioneer. He rose to international fame with Yes and defined a genre of rock music along the way, as Steve’s unique guitar stylings formed the very foundation of the band’s sound. Progressive rock upped the ante significantly in what was possible and what was expected in rock music of the day. Yet as an instrumentalist, Steve Howe cannot easily be categorized. His first solo album debuted forty years ago, and launched him on a journey that has taken him down a seemingly endless array of pathways, ranging from jazz, blues and classical, to folk, bluegrass and rock. His prolific solo career has been an unpredictable passage with twists and turns at every junction, making each new album a surprising venture into genre-bending territory. Always pushing forward with studio craft and virtuosity, each of Steve’s albums reflects the insights he has gathered along the way. Fueling his travels are the love and energies Steve draws from his wife Jan and their family, a passion for the guitar, and of course, the never-ending drive to create and perform music. 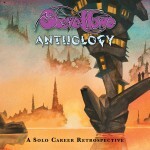 Anthology is an opportunity to retrace that journey and look at the many places Steve has been, as he continues to redefine the role of the guitar in modern music. You have played in so many different styles over the course of your career. Did you set out to represent each of those styles on Anthology and show your diversity? The selection of one track over another can alter the entire mood of Anthology, and that must make it very tricky to select the tracks. You could very easily have gone primarily with acoustic instrumentals, for example, but that wouldn’t be very representative of your career. It’s a funny thing. In fact, Turbulence could have come out nine years after The Steve Howe Album — I think I finished it in ’88. Yeah, that is an interesting thing — I guess when you look at what I did between The Steve Howe Album and Turbulence, it’s no surprise. I was in three different bands — Asia, GTR, and ABWH. So I wasn’t just twiddling my thumbs! I’ve never been happier with an album I’ve done than I am with that first Asia album. But obviously, as that decade went on, it got harder with my songs. I was pretty precious with my songs. I didn’t want anybody to mess with them (laughs). GTR was a big absorber of my writing. At the start of AWBH, Jon came to my home and asked, “have you got any songs?” I gave him six songs, and they make up at least half the album. My songwriting was very active in the ‘80s, in the groups. But I suppose that’s why I wanted to make an instrumental record. Because that’s my area primarily, even though if I could start writing songs I would. I keep getting ideas and I keep writing them. And I have always done that, I can’t ignore them. But I am primarily an instrumentalist, in the sense that most of what I do comes out of a guitar. When the door opened to making your own solo album, it must have been an amazingly exciting opportunity. How did Beginnings come about? I recorded the album in between Tormato and Drama, but “Pennants” was something I recorded in Switzerland while we were making Going For The One. I had written a few songs there, and “Pennants” was one of them. But then I got very picky about that, I wanted to be sure the bass was a very staccato style of bass. I was getting more production ideas about how I wanted the track to sit and how the steel would be set up to slide around and do its thing while it’s playing the melody. The same with the gravely guitar that I’ve got in that one, the Telecaster. So I was really happy to get in that framework. It was partly because of the bass, which makes it more interesting, it gives it more tension. And of course that was an exercise in overdubbing. I’ve got mandolins – I generally throw in the kitchen sink again, a bit like I did with “Beginnings.” On “Look Over Your Shoulder” I got really interested in steel after doing Going For The One and “Soon” on Relayer. I was really in a steel mode, and it’s not surprising that you see me playing guitar in that photo in the Anthology booklet and there is a steel in the background. That was pedal steel on “Look Over Your Shoulder”. That was a nice kind of a whiny thing, and I must say that the reason we chose the track, and the reason we did the track in the first place, was because of the nice feel. and Ronnie Leahy was outstanding. Inviting Claire Hamill was a great idea. She was a dear friend of Alan White and turned in some lovely, penetrating vocals, very serious in the way I like a singer to be serious. It gets you involved in what the song’s about. That’s a song I like quite a lot. I love those lyrics. They’re quite indignant in a way, about people going off the rails — it’s partly about people in the ‘70s who went off the rails. I wanted to produce The Steve Howe Album by myself because I was getting more confident and I had that vision, I couldn’t quite explain it. But obviously I relied very much on Greg Jackman, who did wonderful engineering for me. So that song is quite deep with me, and that’s why I sang it on one of my solo tours. It’s one I quite like singing. I enjoy it. I was having a lot of fun after all this time playing the kind of serious Gibson guitars, and here I was twanging along on a Stratocaster — the cat is out of the bag, I like that too. On Anthology, we calm things down with “Surface Tension” which I used to introduce quite often as my London theme. “Surface Tension” was an important step for me because after “Mood For A Day,” I didn’t write an amazing amount of Spanish guitar. I have a great admiration for Andrés Segovia, Flavio Salva and Carlos Bonell — there are many, many world-class players in this field, and I haven’t even got nails. They all play with their nails. So I always treat the Spanish guitar with a certain reverence. It’s a bit like I am not fully equipped for Spanish guitar. I did get a nice sound out of it once I had settled in. I wouldn’t say that “Mood For A Day,” the original recording, was what I was looking for. It was not what I was looking for. I’m pleased that people like it. I love playing it in a much gentler way than the hard-hitting way, as if I had come off playing a rock guitar and picked up a Spanish guitar. It’s a little bit in your face. So I’ve learned to love the Spanish guitar dearly, and that’s why Time was a great opportunity to do more Spanish guitar than usual. But “Surface Tension” is a very important tune to me. It’s not easy to play. I tried recording it in a church and we had a disastrous evening because I never realized it’s so cold in a church and it was difficult to stay in tune. I present that tune quite well. It’s very much how I like to play it now, if I could. So I do look back at it and I wonder, how do I do it — what’s the tempo of that piece. Sometimes you can record something and get it pretty right, and struggle the rest of your life to get it as good as that. “Sketches In The Sun” started as an electric tune on GTR. I played it on the Night of the Guitar tour on the original guitar that it was recorded on, but I think the original recording suffers from being a very early digital recording. It never had the wholesome sound that came out of this little Danelectro 12-string guitar. So here I play it on the Scharpach 12-string guitar, and it has really become so solid in my solo spots and solo tours that I played on acoustic guitar. Not always on a 12-string, because I actually get more out of it on the six string. 12-strings are quite difficult. But I’m always willing to try it again, and I might well do so in fact. So “Sketches” really became a stronghold solo piece for me because it’s got this wonderful, simple arrangement in space. Like “Dorothy,” they’ve both got space. That’s what music needs, when it breathes interestingly, and that’s the wonderful opportunity of playing on your own, is that you’ve got that space because nobody else is filling it in. And therefore you can create the space you like. I have all of Steve Howe’s solo Cds including Homebrew 1-5 and the two exemplary live Cds. Every CD is invariably brilliant, eclectic, refined, entertaining and virtuosic. Steve amazingly improves with age and is an astounding live performer. He’s been a humane and peaceful vegetarian since 1972 and he must be resplendent with awesome karma. A complete master of the electric and the acoustic guitar. God bless Steve Howe. If any guitar fan owns and listens to “The Grand Scheme Of Things”, “Quantam Guitar”, “Natural Timbre”, “Skyline”, “Elements”, “Spectrum”, “Time” and The Portrait Of Bob Dylan CD it’s very difficult and/or impoossible to name a more virtuosic, diverse and wondrous guitarist than Steve Howe. A Higher Power bestowed him with these ethereal gifts that enable him to perform these incomparable and amazing riffs! No guitarist in rock makes you question your playing like Steve Howe. He makes you think about MUSIC. With all his influences it comes out pure Steve Howe. This is how music is supposed to work. And his technique is fearless. He has been a lifelong inspiration to me as a musician. And a challenging one. Thank you, Steve Howe.